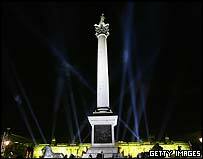 A sound and light show in Trafalgar Square has ended celebrations marking the 200th anniversary of the battle after which the square is named. Crowds watching the show heard the voice of Nelson, played by an actor, tell the history of the Royal Navy. Earlier, Prince Andrew laid a wreath at the foot of Nelson's column in honour of the admiral. He was joined by Prince Charles and the Duke of Edinburgh at a service of commemoration in St Paul's Cathedral. The show, the Spirit of Trafalgar, brought to a close two days of events across the UK and in southern Spain, near where the battle was fought. It began with a description of the Battle of Trafalgar. The display was backed by a portrait of Nelson projected onto a giant screen that hung in the shape of a sail from the north terrace of the National Gallery. Royal Marine Commandos then abseiled down the face of the gallery to the sound of gunfire as the narrator described their role in today's Navy. It came to a close with an illumination of Nelson's column. Earlier in the day, Prince Andrew watched 600 Sea Cadets parade in Trafalgar Square before laying the floral tribute at the foot of the 60m-high Nelson's Column. 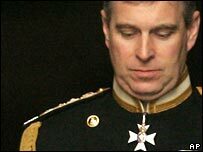 Prince Andrew was followed in paying tribute to Nelson by First Sea Lord Sir Alan West, who also laid a wreath. Sea Cadet Corps chaplain the Reverend Jonathan Cruickshank then gave a reading, telling the cadets that Lord Nelson was a man of "audacious strategy"
"A man dedicated to this task. A man of great humanity. A man who earned the love and loyalty of all who served with him," he said. "Two hundred years [later] and these qualities still inspire us." On Sunday afternoon around 2,500 people gathered at St Paul's Cathedral, where Nelson was buried, for a special service of commemoration. Among the royal guests at St Paul's were Camilla, Duchess of Cornwall, Princess Anne and Prince Michael of Kent. The Bishop of London, Richard Chartres, paid tribute to Nelson, describing him as the "great hero admiral who sleeps directly beneath the dome". Wreaths and bouquets of flowers were left at the Admiral's tomb, along with a number of tributes. The service was followed by firing of a cannon and bell ringing.